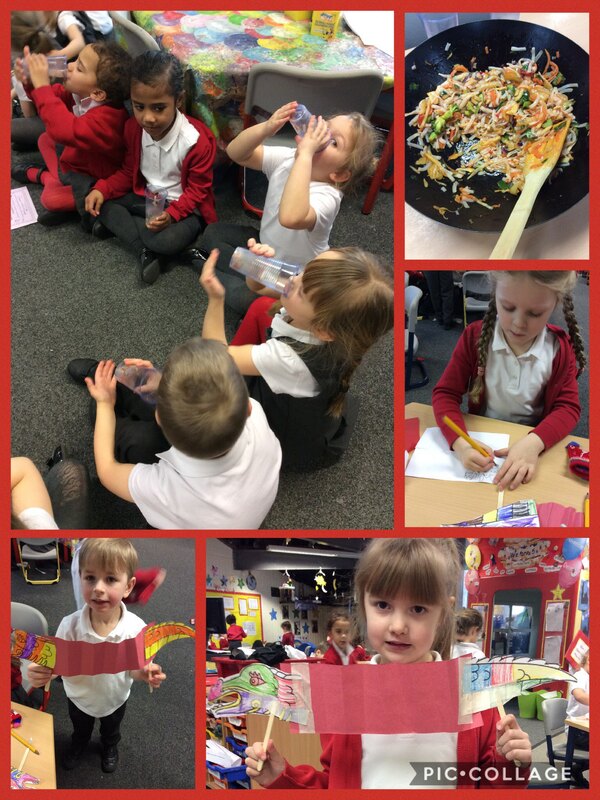 Yesterday in Reception we learnt about Chinese New Year. We made our own Chinese lanterns and dragons, and wrote messages to put inside a fortune cookie. There were mixed feelings when it came to the sweet and sour stir fry! We would love to hear what the children learnt about New Year. Can you remember why red is a special colour? Can you remember which animal in the zodiac it is this year? This entry was posted in EYFS and tagged British Values, R.E. on January 28, 2017 by Sandford Hill. The dragons look amazing children. It looks like you all enjoyed the noodles as well. We will be making chinese food tonight, let’s hope it tastes as nice as yours. Kung Hei Fat Choi and Xin nian kuai le. I have to say though children…sweet and sour is one of my favourite dishes! Isaac wished us all Kung hei fat choi..
Well done children for listening well and remembering lots about Chinese New Year! I’ve got to say I thoroughly enjoyed my Chinese takeaway tonight! Kung Hei Fat Choi everybody!